New Here? Welcome & Come Get To Know Us Here. Let me say just how pleased we are to have you come visit our little neck of the big Internet world. It is our mission to “share our experiences so you can make the most of yours.” We have plenty of life lessons that we’ve learned throughout our lives that we feel can help you make your life better. It is our hope that you’ll also share some of your life experiences with us in our comments section so that others may learn from it too. In a nutshell, we are just a bunch of crazy country bumpkins who love our latest technology toys. We are big into movies and checking out new TV shows. We also like to get outside and climb trees, go for long nature walks locally and enjoy our family bike rides. Del does woodworking using the excess pallets that we get from our family business. I’m a firm believer in a marriage lasting for a lifetime, even though I have personally lived through two divorces of my own. However, even though I’ve gone through those divorces, I have learned an LOT about what a marriage should have in it through many different resources through the years. I wanted to ensure I learned from my mistakes. Not to mention, I am finally married to my true love. Be sure to check out some of our favorite marriage tips posts by clicking on this image. We do homeschool our lovely three kids. It makes life interesting and entertaining, to say the least. So, I have a lot to say on the subject and parenting as a whole. I’m NOT a perfect mother by any means, and I never will be. Many stated that I’m overly strict and too much of a helicopter parent. I’d much rather be overly protective and to strict than, not give my kids a fighting chance at having a real life when they become an adult. Del loves to cover video game reviews and anything video game related. He also likes to ensure that he gives a man perspective on many of the tough topics that most men are afraid to talk about out loud. There are also times he just needs to share something he thought was funny. You can check out his posts in the Thoughts from the Man Cave Page. Crystal does also share some of the top blogging tips that she finds across the Internet when she has enough of them to share on her #BloggingTidbits posts. Sometimes, those tidbits are also about how to make money from home or making your life easier. Those are honestly some of her favorite posts to write. She has also started creating How-To videos on our Youtube channel. If you have a blogging question or some other question, you would like answered, please shoot her an email using this form. She does try to do book reviews as well. However, she has found that the pressure, of having a book thoroughly read by the end of the week, was getting to be a bit much. She slowed down on the book reviews that are through another company or the author’s themselves. She wants to have book reading as a pleasure still because it is one of her favorite things to do besides write. She will still be doing book reviews on Sundays as much as possible, but it will be on her terms and in her way. Our kids are very tech savvy. They love to do many educational programs online. According to them, “it helps make learning fun.” They are huge soccer fans. All of them love a good kids movie. They enjoy as much time outside as the weather permits. They are not camera shy nor are they afraid to voice their opinions on all things. 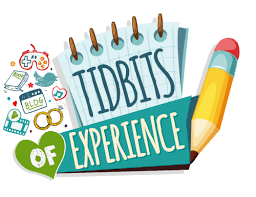 Granny Lee will be adding her craftiness to Tidbits of Experience. She loves to do crafts with the kids. She also loves to do quilting, knitting, and many other crafty things for her personal pleasure too. She’ll be sharing the crafts as she gets them done. You can find Crystal on Twitter at Tidbitsofexperi. You can find Del at Incredible_Gru. We’d love to connect with you on Pinterest, Facebook, and Google+ . You will find us mostly on Twitter. Our YouTube page has been gaining more videos now that we have our feet wet in that department. Of course, our email box is always open. You can send us an email here. Here’s to sharing our life experiences one blog post at a time with you in hopes that you’ll share some of yours with us too.